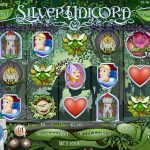 Silver Unicorn is a 5 reels 20 paylines slots game released by Rival. 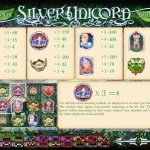 As you could imagine from the name you will encounter symbols like the silver unicorn, a princess, a tower, a treasure chest a fairy and others. The Wild in this game is the Silver Unicorn symbol. It can also expand to help you win even more combinations and appears on reels 1, 3 and 5. There are also two scatters here. The first one is the Rose scatter and landing 3, 4 or 5 will win you 5, 10 and 25 Free Spins respectively. All this will comes with a 3x multiplier and the chance to re-trigger the free spins when landing more Rose scatters. The second scatter is the Butterfly symbol. Landing 3 or more anywhere on the reels will trigger the Bonus Game. Here you you see a series of cards which you need to remember. Then you will need to match their pair when they face down. This game is fun and entertaining and potentially can win you a lot of cash. We think you should certainly give it a look cause it could be your lucky game. Are you a fan of St Paddy’s Day? 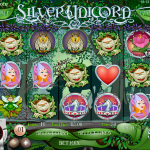 Try playing Shamrock Isle a 5 reel slot by Rival.